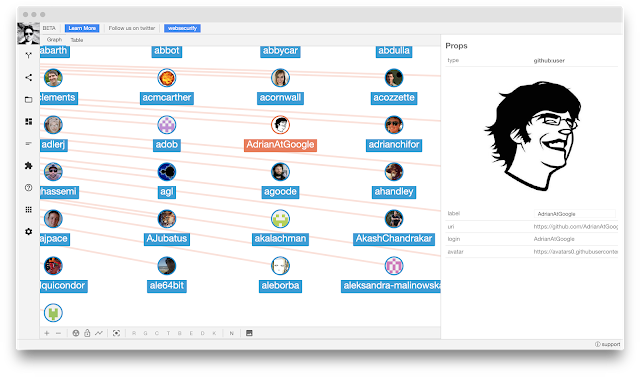 Pown Recon is a target reconnaissance framework powered by graph theory. The benefit of using graph theory instead of flat table representation is that it is easier to find the relationships between different types of information which comes quite handy in many situations. Graph theory algorithms also help with diffing, searching, like finding the shortest path, and many more interesting tasks. This tool is meant to be used as part of Pown.js but it can be invoked separately as an independent tool. WARNING: This pown command is currently under development and as a result will be subject to breaking changes. To demonstrate the power of Pown Recon and graph-based OSINT (Open Source Intelligence), let’s have a look at the following trivial example. Let’s start by querying everyone who is a member of Google’s engineering team and contributes to their GitHub account. You just created your first network! The representation is tabular for convenience but underneath we’ve got a model which consists of nodes connected by edges. If you are wondering what that looks like you can use SecApps Recon. The command line does not have the necessary level of interactivity to present the complexity of graphs. Since now we have two files google.network and google2.network you might be wondering what is the difference between them. Well, we have a tool for doing just that. This is how we do it. Now we know! This feature is quite useful if you are building large recon maps and you are just curious to know what are the key differences. Imagine your cron job performs the same recon every day and you would like to know if something new just appeared which might be worth exploring further. Hello, bug bounty hunters!